Very, very few, or perhaps no-one, has been able to sustain a 50% success rate at the highest level of sporting competition. 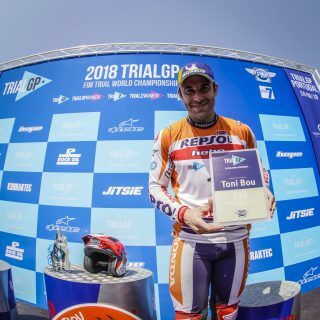 Recently in Portugal, Toni Bou finally got to achieve such an extraordinary figure, not to mention the equally outstanding stats from indoor trial competitions (or X-Trial) with a win rate of 70%. 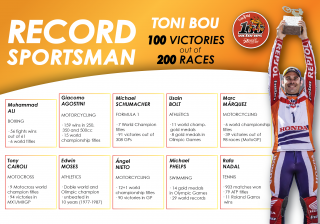 Considered the greatest of contemporary athletes, Jamaican Usain Bolt is also one of the athletes most admired by Toni Bou for his eleven World Championship gold medals and eight Olympic golds in addition to repeatedly breaking world records. Likewise, Edwin Moses another athletics legend. King of the 400 metre hurdles, he remained unbeaten for ten years (1977-1987), scoring 122 consecutive victories. In swimming, fourteen time Olympic gold medalist Michael Phelps is the most garlanded in the history of swimming. He achieved 29 world records in individual styles. The most admired figure in boxing, Cassius Clay also known as Muhammad Ali, marked a milestone by winning a total of 56 out of 61 bouts, with only five career losses as a boxer. If we are talking about achievements Rafa Nadal would undoubtedly have earned a place on the podium of greatest Spanish athletes, with a total of 903 games won, 187 lost (20%) and 79 ATP titles in addition to eleven clay court trophies in Paris. 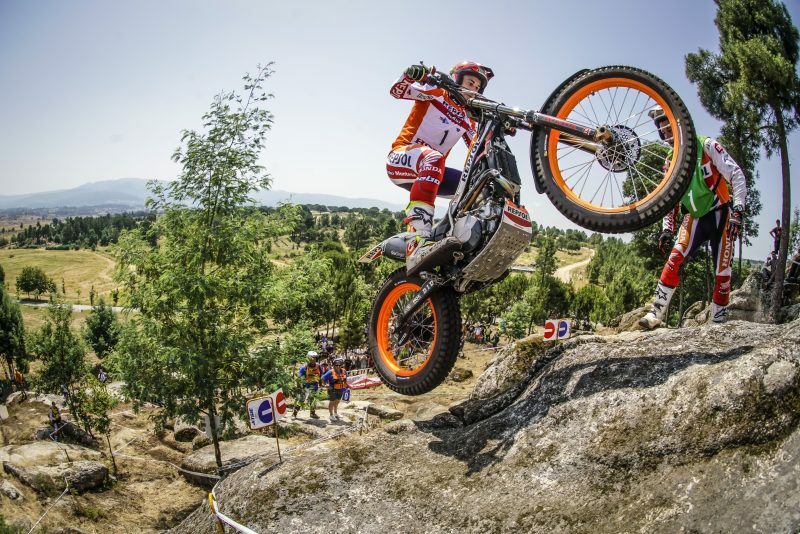 In motorsport competition, different specialties have brought several notable achievements: the 13 Dakar wins of Stéphane Peterhansel or American Supercross and Motocross rider Ricky Carmichael who has scooped seven AMA MX450 titles and five AMA 250 titles with 150 victories and 48 victories in Supercross, a serious contender for the Greatest of All Time. 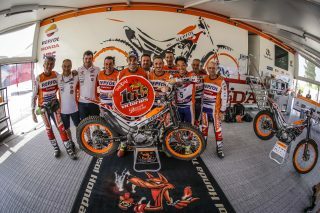 Riders who come close to some of Toni’s stats, include motocross rider Stefan Everts with 10 World Championship titles in 125, 250 and 500 / MX1 and a total of 101 victories. 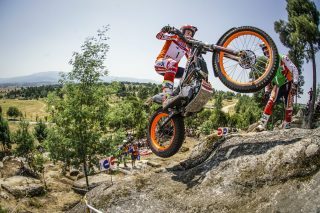 Similarly, Antonio Cairoli, with a total of 94 victories in MX1 / MXGP. In the world of speed the name par excellence is Giacomo Agostini. 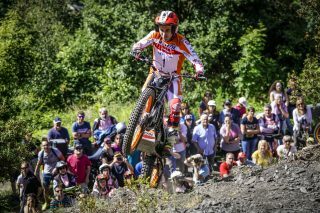 The legendary Italian rider is the competitor to have accumulated the most victories throughout his racing career: 159, although these were achieved in different categories. In the top category he notched up a total of 68 triumphs. 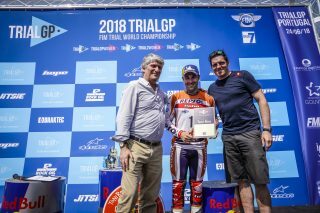 Sponsorship stable-mate at the Repsol Honda Team, Marc Márquez, six time world champion – four in MotoGP – has clinched 39 top category victories out of a total of 98 races, a better percentage than even Valentino Rossi, who with nine titles in different categories, has competed in a total of 311 races (500 / MotoGP) with the Italian taking 89 wins, at a 28% success rate. Finally, we should point out 12 + 1 time world champion Angel Nieto, who accrued a total of 90 world championship victories in various categories. Finally, from two wheels to four: German Michael Schumacher competed in a total of 308 races with a final balance of 91 wins, a 30% win rate. 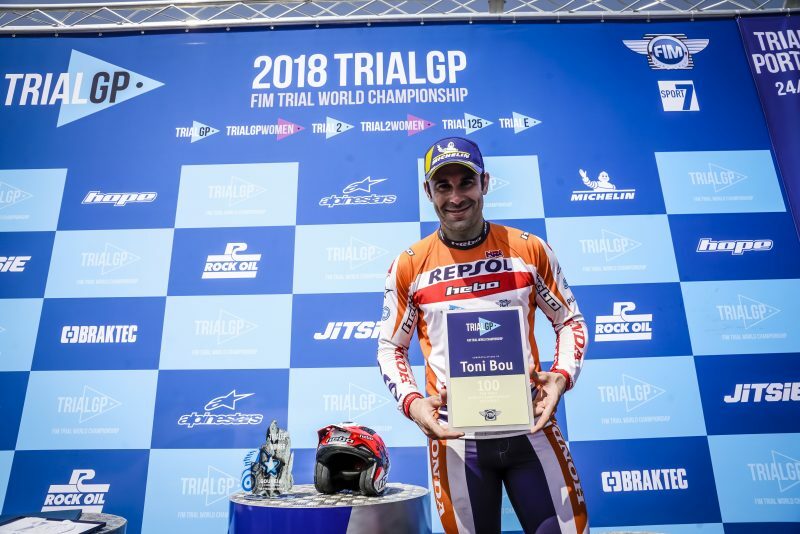 THIS YEAR TONI BOU TOOK HIS VICTORY TALLY TO 100 VICTORIES OUT OF 200 TRIALGP EVENTS (50%) IN ADDITION TO 57 TRIUMPHS OUT OF 81 X-TRIAL EVENTS (70.37%). 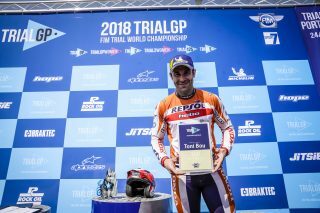 In his 2003 debut in the Trial World Championship in Ireland, Toni Bou picked up his first point in the contest. Three years and forty-five races later, he won his first trial, in Nigrán, Spain, thus launching a winning spell that would continue up until very recently when he finally passed the long-standing record of 99 wins. Bou reached the milestone on the very day of his 200th top flight trial appearance. – Congratulations, Toni. You have once again made history in this technical and exciting sport: 100 victories out of 200 world championship participations. Extraordinary! – Yes, thank you very much. 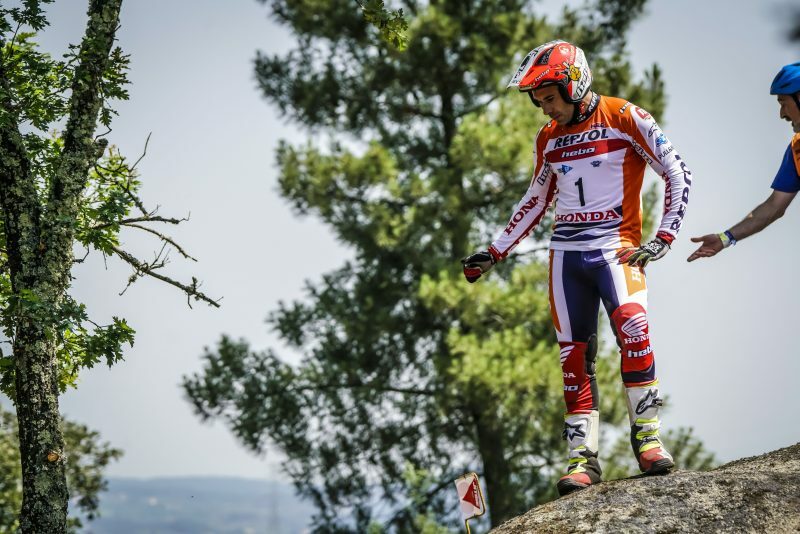 I am very happy and excited about last Sunday’s trial, about how it went and to have achieved that magic figure. Winning 100 trials is something sensational, but doing it in 200 events is an incredible efficiency rate. I was very excited to clinch it and I think it is the result of all the great work we have done over ten years working as a team. One thing is certain: I will go on fighting for more successes. – Was the weekend a repetition of the feeling of the first victory, in 2006? Were you aware that you were making history? – Your data is stratospheric; Very few athletes have achieved such excellent figures in other competitions. -The most important thing is to have been lucky enough to maintain a top level of fitness which allows one to stay among the best athletes on a regular basis. We have had so many victories that you lose count. In fact, if it weren’t for the people in my team keeping me up to date about it, I wouldn’t even know the numbers, because it is something I prefer not to have in my head. They are some pretty spectacular numbers, yeah. I have to be grateful to the people who have helped me since I was a kid: the whole team. The space to thank everyone would have to be a very big one. That’s why I am so pleased and above all, motivated. Motivated to continue achieving greater successes and improving on these figures. – Are there many elite athletes on the list that you admire? –Yeah. Loads! 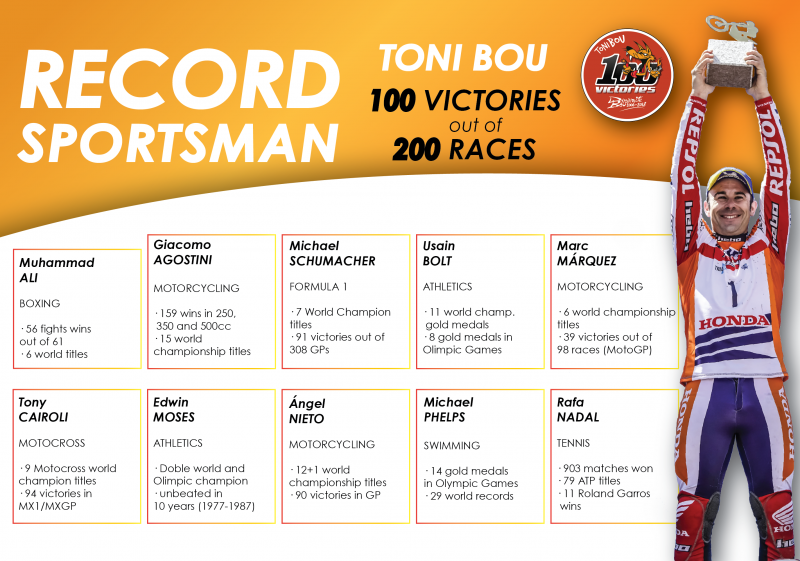 Usain Bolt, Phelps, Schumacher, Cairoli… there are many idols. Being on a list with them really excites me. So many successes in such a short space of time is something great. – Who do you like, or would have liked to see in person? -Bolt is one of the ones I’ve always wanted to see in action: his power and mastery of the race is spectacular. I would have also liked to see Mohammad Ali, who had a lot of victories and few defeats. 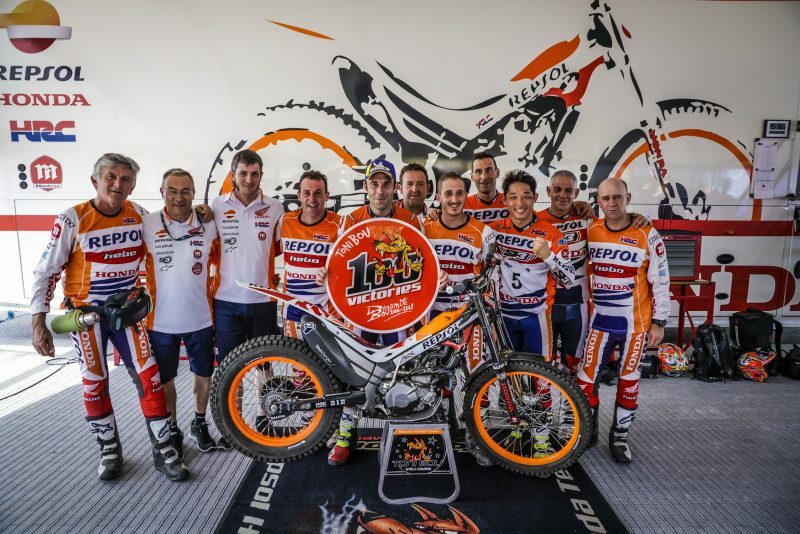 Another one that I like, because he’s my contemporary, would be Antonio Cairoli, who has similar stats and whom I often bump into at FIM galas. 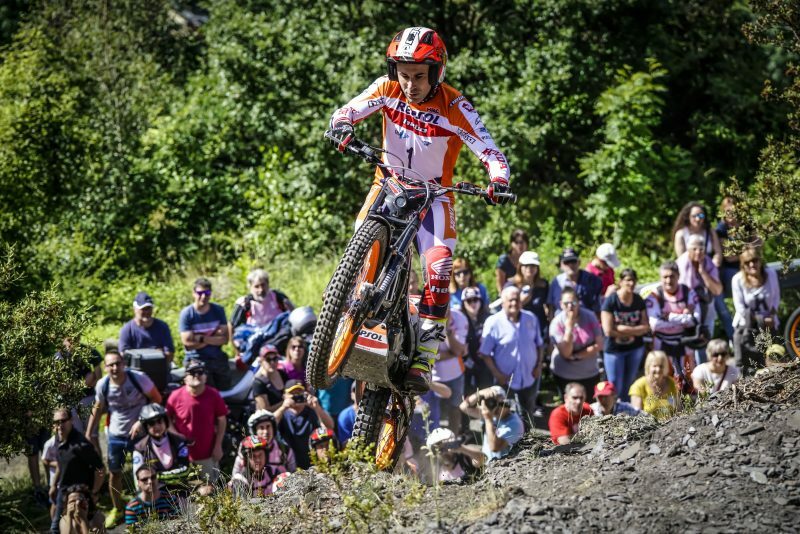 He has had some serious injuries over the years and was able to come back to the competition stronger than ever and win the world championship again. -It seems obvious to think that you remember the first victory… but will you remember number 100? -Yes, sure. The first one is unforgettable, I remember perfectly where and how it was and I will also remember number 100 because this year has also been so special: with the injury and breaking Lampkin’s record. 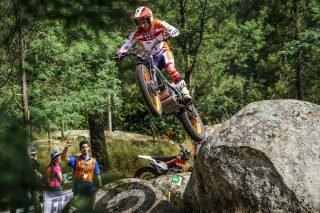 We talked about it happening in Japan but it wasn’t to be, but both events in Andorra, where I won the 99th and the one in Portugal, the 100th, are trials that I will never forget.